I'm so fortunate that I was given the opportunity to review this book before it's release. 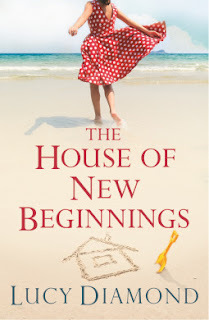 The House Of New Beginnings by Lucy Diamond is such a touching and uplifting novel, and I loved it! Located on the Brighton seafront is Number 11, Princes Square. Although it may appear to just be a home, to the tenants, it is a place of hope and new opportunities. The newest resident is Georgie Taylor, who is in a committed, long-term relationship with her partner Simon. The couple have made a temporary sea-change to Brighton for Simon's work as an architect. Her days are long and uninteresting, so she is thrilled when she lands a job as a journalist for an agony aunt column, but things go pear-shaped pretty quickly. Rosa is 35 years old, and has an unsatisfying job as a sous chef in a local restaurant. She moved into the apartment block after her relationship went downhill after a dreadful revelation. She is finding it to difficult to get over the hurt that she's been through, and is frustrated that her dreams may never become reality. The tenant in Flat 4 is Charlotte Winters. She works in a law firm, and is very lonely and depressed. She is 38 years old, divorced, and experienced an extremely unfortunate tragedy which she is trying to overcome. In Flat 5, Margot Favager is an elderly French woman who has been a resident at Princes Square for 20 years. She is carefree and has a positive outlook on life, even though it has dealt her the cruelest blow. And finally, Jo is a nurse on a cancer ward. She is divorced, and lives with her teenage daughter, Bea, whom she adores. Initially, these people are virtually strangers to each other; a hurried 'hello' here or there as they bustle about their days is as far as their relationships extend. But circumstances see the residents finding each other and coming together, and once they do, beautiful friendships are formed. With the support of one another, and belief in themselves, they begin to find happiness and hope again. This book is wonderful. I've continued to think about it days after I've finished it. It made me cry, and it made me smile and laugh too. It made me think about how others may be feeling, and the brave faces we put on at times in our life when things are difficult. The novel is just under 500 pages, and it is perfectly paced. Lucy Diamond gives the characters such depth and individuality. We find out about their past, their present, and their desires for the future. I was so moved by each of them, especially Charlotte. There is a very important, beautiful message that gets bought to our attention in this book. It is the importance of having or being a supportive person to someone. We all have our heavy loads to carry, but with support, care or just a kind word, that load can get lighter. If I had to pinpoint one minuscule criticism, it would be that the ending felt a little bit 'too perfect', but I still wouldn't change it. After all, I do love a happy ending! I would highly recommend this book, especially for those people that have ever felt as though they have lost their way in life. Or for those who just love a fantastic read! Disclosure: I was given a copy of The House Of New Beginnings through Pan Macmillan Australia. All opinions are my own, and are not influenced in any way. I was not paid for this review. This one sounds like something I'd enjoy. I haven't read anything by Lucy Diamond, so looking forward to starting with this one.